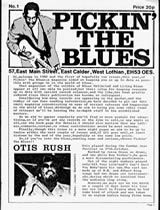 Blues & Rhythm was first published in July 1984 continuing the long tradition of blues magazine publishing in the UK, which dates back to the early 1960s with magazines such as R&B Monthly, Hot Buttered Soul, Blues World , Shout! and the daddy of all blues magazines, Blues Unlimited. The origins of Blues & Rhythm Magazine lay in two magazines: the irreverent Sailor’s Delight and Pickin’ The Blues. Sailor’s Delight was predominantly a record sales and auction magazine selling 78s, 45s and albums published by Paul ‘Sailor’ Vernon. The magazine included spoof articles and genuine research on blues and r&b. 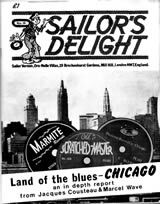 Sailor’s Delight ceased publication after seventeen issues when the first issue of Blues & Rhythm was being planned. Pickin’ The Blues, edited by Mark Harris, covered blues research, album reviews, blues news and gig reports. Pickin’ The Blues ceased publication after issue number 25, allowing its outstanding subscriptions to be absorbed into a new magazine, Blues & Rhythm, The Gospel Truth. Initially B lues & Rhythm was an A5 sized magazine, but by issue 19 we switched to A4 size. Blues & Rhythm publishes a 48 page magazine, ten times a year, using full colour. Besides our main editorial team (Tony Burke, Tony Watson, Byron Foulger, Phil Wight and Mike Stephenson) our regular writers, reviewers, researchers, correspondents, photographers and critics include Mary Katherine Aldin, Mike Atherton, Steve Armitage, Chris Bentley, Gary Blue, Scott M. Bock, John Broven, Norman Darwen, Bob Groom, Paul Harris, Dan Kochakian, Peter Lowry, Paul Mooney, Opal Louis Nations, Victor Pearlin, Dave Penny, Steve Propes, Fred Rothwell, Mike Rowe, Howard Rye, Keith Schoffam, Neil Slaven, Brian Smith, Chris Smith, Gary von Tersh, Ray Templeton and Billy Vera. Here’s what you need to do if you’d like to subscribe to Blues & Rhythm. You can also explore our list of Back Issues.